Albania’s piano music is infused with rich folk melodies, rhythms and harmonies that have been passed down over hundreds of years. The piano tradition itself is a comparatively recent phenomenon, as prior to the 20th century Albania’s folk tradition prevailed, with a nascent classical music presence emerging in 19th century choral and instrumental ensemble repertoire. Under Enver Hoxha’s communist regime (1944-1985), the classical music tradition was nurtured and advanced. The most talented composers were sent to Moscow for training (until Albania’s détente with the USSR in 1961), and other students, including performers, were allowed to travel to Czechoslovakia, Hungary, Poland, Italy and France for studies, provided they themselves posed no perceived threat to the state. Several conservatories and an Academy of Music were established in Albania during this time. Hoxha forbade the study of all music written after 5 March 1953 (the date both Stalin and Prokofiev died), all of the works of Shostakovich and Stravinsky, and all dodecaphonic and impressionistic pieces. Every new composition had to be approved by the League of Artists and Writers of Albania before it could be performed publicly. Any piece composed had to be ‘for the people’ and deemed accessible. Therefore composers relied heavily on the rich folk music heritage of Albania, using folk melodies, dance rhythms and the imitation of folk instruments in their pieces. 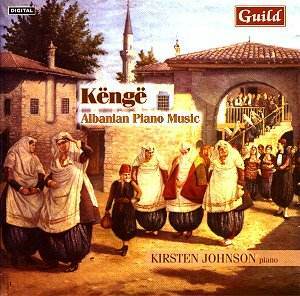 Albanian piano music is strongly influenced by this folk tradition, and must be heard and appreciated in the context of the restrictive environment in which it was composed. Këngë (Song) is the eleventh piece in Kozma Lara’s (b. 1930) cycle for piano Ditë të Gëzuara (Joyful Days). The gently rocking accompaniment provides a background for this hauntingly beautiful setting of an Albanian folk song. March (pub. 1975), a caricature of a military march, features seven-bar phrases and a fluctuation between a feeling of two and four beats in the bar, characteristics which endow the piece with unsettled cynicism. Lara’s Ballade no. 4, ‘Pastorale’, reflects the ancient Albanian folk story-telling tradition of the epic ballad. These sung stories are historical in nature, and are passed down orally from generation to generation. Published in a pedagogical collection in 1975, the repeated notes of the opening melody become a unifying device of this piece. In three sections, the outer parts are linked by a slower, more introspective middle section. Valle: moderato (Dance), a short piece in A minor published in 1971, is in 7/8 time. The stark qualities of this work give it a particular emotional poignancy. Valle: allegro (Dance, pub. 1975) is jaunty and fun, full of twists that take one by surprise, and rhythmic drive which gives the piece edge. Pellumb Vorpsi’s (b. 1957) Variations for Piano (Ballad) on a Popular Theme (1978) is based on the folk song, ‘Why does the blackbird cry?’ Six variations follow the simple choral statement of the theme. The first is straightforward, with the unaltered melody presented over broken chord figuration. The second variation is highly rhapsodic and more exploratory in nature. The third is an allegro written in perpetual motion toccata style, followed by the fourth, a more extended variation in which Vorpsi derives his material from the second bar of the original theme and places it over a tango-like ostinato. This darker and more introspective variation is linked to the fifth variation by a brief cadenza. Variation five, an electrifying allegro agitato, is interrupted by the sixth variation, a grandiose statement of the original theme in widely-spaced chords, before building to a shattering climax which unwinds into the bass of the piano. This highly enjoyable set of variations ends with a quiet remembrance of the first half of the original theme. Çesk Zadeja’s (1927-1997) Four Pieces for Piano is a collection of individual works gathered together by the composer. Improvizim (1986) is a masterful free-form portrait of historic grandeur with Turkish influences showing in the melodic presentation. Humoreska (pub. 1966) is taken from Zadeja’s balletDelina. The opening rhythm, a unifying element of the piece, is associated with the daulle, a folk percussion instrument. The first section, in which the melody is set out in parallel fourths, is reminiscent of a men’s dance, and is followed by the female dancers being represented in a higher register with parallel first inversion triads. A gentle waltz interrupts the rambunctious dance, which quickly reasserts itself and brings the piece to a boisterous finish. The third piece, Prelud (pub. 1989), is an impressionistic setting of a simple melody against quaver accompaniment. Tokata (1986) opens with a spiky left-hand melody crossing from bass to treble against an ostinato pattern in the right-hand. It is eccentric and humorous, driving forward until relaxing into an improvisatory middle section decorated with trills and figuration. The toccata returns again, building into a climax of chords and octaves that leads to a thunderous conclusion. Tonin Harapi (1928-1992) is one of the most revered Albanian composers. Romance in Ab major(pub. 1987) creates a mood of tranquillity at the outset, becomes more passionate as the melody is developed, and moves into a sprightly allegro section before returning once again to the ambience of the opening. Valle: andante con moto (Dance, pub. 1966) is based on folk dance rhythms, evoking both a waltz and a mazurka at different stages. Nji dhimb je e vogël (A Little Pain, pub. 1966) grieves after a loss, but becomes reconciled to that pain as the piece moves through shifting harmonies. Valle: allegro vivo (Dance, pub. 1966) is an exuberant rollick in a folk dance style. Romanze in A minor’s (pub. 1966) very serenity arises from Harapi’s opaque treatment of an uncomplicated melody, which is briefly developed before returning in a slightly altered guise. Moll ‘e kuqe top sheqere (A Candied Apple, pub. 1966) is a charming piece in 7/8 time, reflecting the simplicity of childhood treats in its setting of an off-beat melody against a rhythmically hypnotic left-hand accompaniment. Two northern Albanian folk songs are the basis of Harapi’s Waltz on a Popular Theme (pub. 1987), a favourite piece of Albanian pianists. ‘This folk-exotica is sympathetically played by Kirsten Johnson who also wrote the excellent notes. I wonder if she is planning a second Albanian volume. If not perhaps she and Guild might consider doing the same for the piano music of Bulgaria and Rumania.